Last time I brought Kili to the street carnival I discovered that one of her new primary feathers was out of alignment on her bad wing. I kept trying to figure out what was wrong with it and couldn't tell if it was broken. This one had just grown in and was the first feather from her second molt to grow on the wing missing all but one primary. All of the other primaries (except for outer most one) broke off since her first molt. Later that evening I spotted the new feather completely rotated 180 degrees and essentially connected upside down. I figured it must have broken across the quill but I could not find any damage. I gently pulled and it came right out. The quill was still intact and there was some blood. This feather was just changing from the blood feather to mature feather stage. I was really disappointed because I was really counting on this feather to give support to the one remaining primary and to give protection for when that one molts. I had been considering bringing Kili to the new vet that I have been using for Truman and had mentioned to them Kili's wing condition previously. At this point with a freshly broken primary I decided it would be a good time to bring her in for analysis. I was also a bit concerned that there could have been some irritation or infection where the new feather broke out from. From my own research and consultations I have received, I figured this was just a case of post-clip regrowth trouble but I was still worried in case there was any kind of actual problem. Kili behaved very well and everyone was amazed at how tame she is. They didn't need to towel her, just a normal grab and head restraint did the trick. She showed all signs of being a healthy parrot. 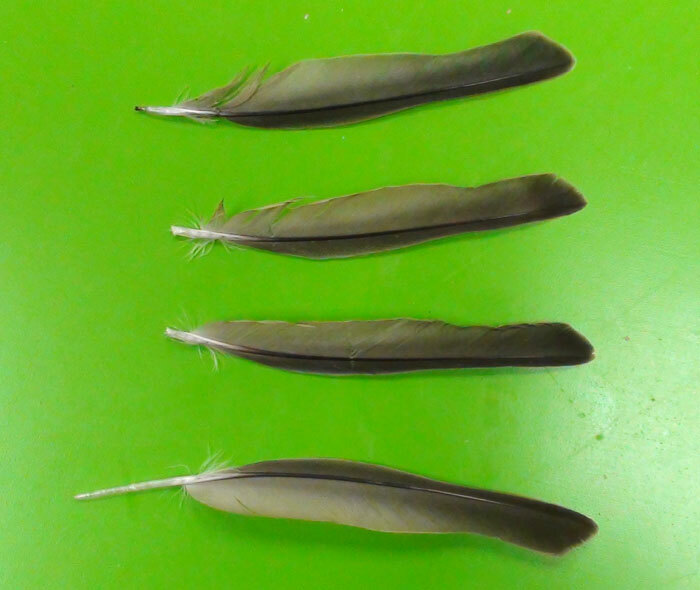 I brought in samples of broken primary feathers, intact, and the newly fallen one. The vet examined the feathers and Kili's wings but could not find any abnormalities. My earlier suspicions were confirmed that the lack of support from additional primaries causes the remaining ones to break. There is nothing that can be done about it and no dietary changes are needed. 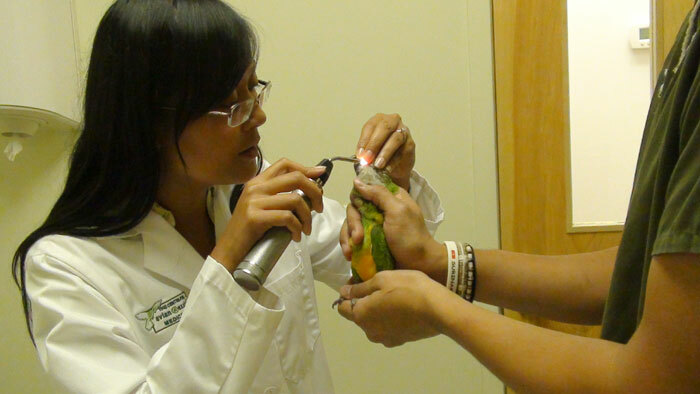 The vet proposed to take a blood test to check for Polyoma or PBFD as they can cause feather problems. But I pointed out that the other wing is in excellent condition and that the disease should probably apply symmetrically. Nothing else can be done to stimulate or check the feather follicles so it is only a matter of chance and time that Kili mends her wings. To justify the visit I asked if they could trim Kili's talons. They have become razor sharp and she was really doing damage to my skin by that point. The vet requested her assistant to bring out the dremel. I was shocked that they would apply a tool 3 times the size of the bird and asked if they could use scissors instead. The vet used an ordinary nail clipper and barely removed anything at all. 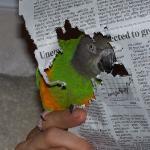 While the groomer at the bird store I bring Kili to can do an outstanding job, even I can trim a lot more than that. The vet barely took 1/32" off and I'm sure they'll be back to where they were in a week. The reason I don't like doing it myself is because I get really stressed out and worried about cutting too far but generally get it spot on. But it takes me an awful long time to do it because I reward each clip and am super careful. I thought the vet would at least trim as much as I do if not even more but this kind of trim job really did not help much at all. This reaffirmed to me that the bird store is the most skilled and practiced when it comes to grooming. I would estimate that the groomer at the store will take about 1/8" off at a cut, I'll go as far as 3/32", but the vet did a mere 1/32". I could do that much in a single session of hand filing but I find that a good cut makes the talons bluntest. I am relieved to find out that there is nothing wrong with Kili but disappointed that there is absolutely nothing that can be done. It's been hard on her because she still flies with one whole wing but the other wing is pretty helpless. Right now I'm taking it easy with her and avoiding flight training. I'm feeding her abundantly in hopes that this molt will bring fresh primaries and help build her wing up. When she has her wings back, then we can always go back to flight training. To finish off the vet visit Kili impressed the vet with how smart she is. She did wave, shake, nod, hello, wings, and play dead. There was no need for treats, Kili was just happy to be such a show off. Let me just mention that I decided not to bring Truman to the vet for a followup because he had just started to get better in very small increments. I really did not want to take a chance of stressing him into not eating again so decided he'd get more benefit out of staying home and relaxing. Ahahahaha! Yes, birds do know how to relax! And they are so content with such simple pleasures, aren't they? GooseBlossom has had unexplained tail feather issues most of his life. I am interested in following Kili's progress and hopefully will get some new insights. Whew! Thank goodness there isn't anything wrong with Kili. It's no surprise that she won the hearts of the entire vet's office. I agree with Kim. 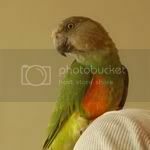 Years ago I had the same kind of problem with my grey.. it was almost sure that it had to do with molting. One wing was perfect.. that other one was very weak and vulnerable. Glad Kili is doing fine!